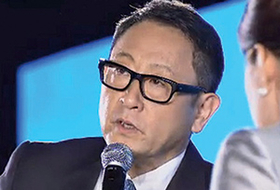 Toyoda, pictured, has been at the helm of Toyota since 2009. Toyota is also shifting the chief engineer of its Prius gasoline-hybrid to its EV efforts, appointing Koji Toyoshima to head the division's engineering team. Toyoshima will also join the four-member EV strategy unit, which will include representatives from group suppliers - Denso Corp, Aisin Seiki Co, and Toyota Industries Corp. The change comes as the U.S., China and European countries are encouraging automakers to make more all-electric battery cars as they push alternative energy strategies. Earlier this month, Toyota said it will develop cars with up to 15 percent greater range and battery life in the next few years.